A kidnapping case in Northern Ireland threatens to unearth long-buried secrets. 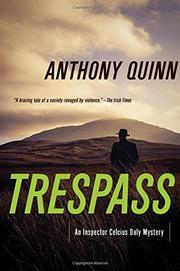 At the beginning of Quinn’s latest inspector Celcius Daly mystery (Silence, 2015, etc. ), Samuel Reid, an old farmer, receives a visitor who has new questions about an unsolved murder from the time of the Troubles. A few days later a boy is kidnapped outside a courthouse in bustling modern Belfast. Called upon to investigate the boy’s disappearance, Daly starts to suspect that the two cases may be linked. Someone wants to bring the past to light. Someone else wants to keep it hidden. It’s a common conflict in the history of Northern Ireland—and in detective novels. At his best, Quinn offers moments of fine, even lyrical writing, as when the details of Daly’s old cases are “fixed at a remove” in his mind “like half-submerged buoys in a fog-bound sea.” Unfortunately, he is less inventive when it comes to his characters and themes. Celcius Daly is divorced, middle-aged, a loner, haunted by the past, good at his job but “prickly and exasperating” in the estimation of his colleagues and superiors. Readers have met this kind of detective more than once before. And while the idea that past crimes are never really dead and buried certainly has resonance in Belfast, mystery writers from Los Angeles to Tokyo have said much the same thing. This detective novel about the inescapability of history is itself trapped in the past of the genre.